Just as the young kangaroo bounds away then back to the security of the pouch, the toddler is eager to explore alone then rushes back to the parent for reassurance. While the desire to investigate urges the toddler forward, the need for the adult’s security is at the core of the child’s enormous potential to learn. Kindermusik Our Time recognizes his need for both the freedom to try and assurance of your support. A weekly class for children ages 1 ½ to 3 years accompanied by a parent or caregiver. Class length: 45 minutes. 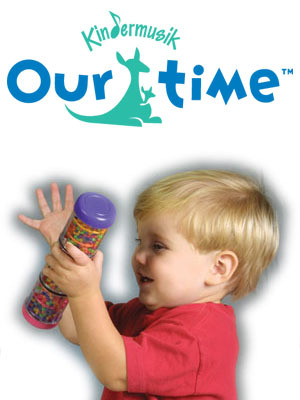 Our Time focuses on your child’s emotional development as his confidence, curiosity, self-control, and communication begin to take shape. Exploring nurtures his self-esteem and facilitates his discovery of textures and sounds. Language skills are fostered with singing, sound imitation, rhyming and object identification. Creative dancing to different musical “moods” develops his sense of balance, timing and spatial awareness while affirming her urge to move. The anticipation and rewards of listening are introduced, and with turn-taking activities, social skills begin to blossom. Essentially, Our Time provides the safety of training wheels for the bicycle of preschool. Our Time brings together children, each with a parent or caregiver, for weekly classes of singing, chanting, listening, moving, dancing, and simple instrument playing. You take home specially designed Kindermusik Our Time At Home materials to extend the Kindermusik experience all week long. Kindermusik At Home materials include two CDs, two Music and Movement books, a Home Activity Book, and a specially designed instrument, all to encourage self-directed lay and experimentation introduced in pre-school. For available class times and rates call 740-498-8090.